A Wyoming tradition since 1957, the town square shootout is a reenactment of frontier justice. Come see the one and only shootout gang on the northeast corner of town square in downtown Jackson Hole. This great event will please all and give you a taste of good old western fun. Jackson Hole is commonly known as “The last of the old west." Visitors from around the country join us in celebration of our rich western history. Amongst the array of activities you will enjoy; a one of a kind old west parade, western music and entertainment, coach rides, hawk and knife competitions, Native American street dance and memorial, town square shootout, Jackson Hole Rodeo, and our beer and wine fest. Come enjoy the cowboy culture. 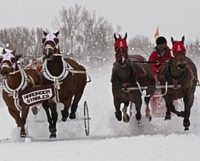 This legendary event has been running since the first settlers arrived over 100 years ago. Where the west is still wild, enjoy bull riding, saddle bronc riding, barrel racing, calf roping, full concessions and much more. For more information visit www.jhrodeo.com. Jackson Hole's iconic town square hosts summer's Saturday farmers market. Buying and eating the locally produced foods supports non-profit organizations and local farmers. Every week you will have a chance to enjoy fresh produce, herbs, fruits, freshly baked bread, homemade pies, home baked goods, locally raised beef, cheese, honey, and flowers; not to mention local music and great recipes. For more information visit www.jacksonholefarmersmarket.com. Start your day enjoying the annual 4th of July parade which features music, horses, clowns, rolls skates, classic cars and much more. Then gather your friends and family and head over to grab a nice spot on the grass where you will enjoy the annual Music in the Hole which includes local groups and popular bands. 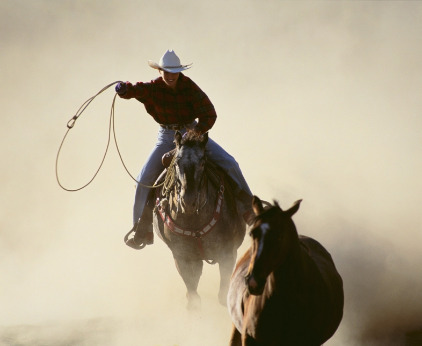 The town square shootout and Jackson Hole Rodeo will fill your evening full of good old western fun. 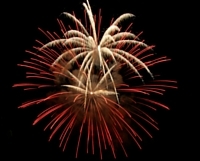 Firework shows will be announced annually in the Jackson Hole News & Guide. Grand Teton Music Festival musicians have been bringing the finest classical music from around the nation to the Jackson Hole Valley since 1962. The concert series takes place in the beautiful, acoustically-acclaimed Walk Festival Hall, located in Teton Village at the base of Jackson Hole Mountain Resort. For more information visit www.gtmf.org. Rich in western history, the Jackson Hole Art fair will showcase its diverse forms of art twice during the summer season. This family-oriented event features national and local artists, live music, food, and snack booths, as well as hands-on activities. Come enjoy the beauty while supporting visual arts from across the country. For more information visit: www.jhartfair.org. Art enthusiasts from all over the country flock to Jackson Hole for this spectacular event. World class artists display their wonderful array of contemporary, culinary, landscape, Native American, wildlife, and western masterpieces. Art, music, cuisine, and wine combine make this event one you don't want to miss. 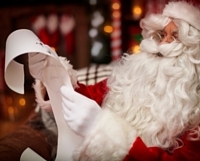 December 15th – December 24th evenings between 5:00 pm-7: 00 pm Santa awaits visitors on the southwest corner of the town square in his cozy warm workshop. Parents be sure to bring your camera so you may capture your children's smiles as they present their wish lists to Santa. Town square will be lit up with thousands of glistening lights to offer you a wonderful winter backdrop for your seasonal family photos. What a great way to ring in the New Year! Join visitors and locals at the base of Jackson Hole Mountain Resort to watch the mountain staff as they parade down the Apres-Vous ski run with beautifully glowing torchlights. The parade is followed by a renowned fireworks display over Teton Village. A ten-day event beginning late January, similar to the Tour De France, the race stops in a different town each night. 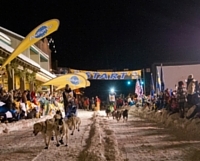 The title sponsor Pedigree works to spread the word and make contributions for childhood immunizations, to make sled dog racing more accessible to the public, and to provide dog food to local animal shelters in need. This small town fun brings food, cocktail receptions, a toboggan race, a torchlight parade, and fireworks to the Jackson Hole Valley. For more information visit: www.wyomingstagestop.org. 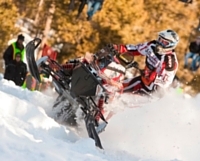 A four-day event scheduled mid-late MarchThe Hill Climb is one of the largest non-profit charity snowmobile events in the United States. Over 10,000 fans and 300 snowmobile racers come together at the Snow King Mountain in downtown Jackson Hole for this lively event. For more information visit: www.snowdevils.org. 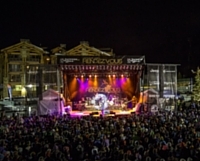 Jackson Hole Rendezvous Mountain Festival brings excitement to Teton Village as the resort heads into its final week for the winter season. Ski events, a headlining live music act under the tram, and a grand fireworks display can all be enjoyed on this festive weekend.